The State of Maine has been a Deighton client and user of dTIMS software since 1990 when the application was first implemented as a state level pavement management system. The Maine highway network maintained in dTIMS is comprised of approximately 7,600 miles of paved highways and 2,700 bridges. This project was awarded to Deighton to assist in the adoption of new strategic policies as analysis parameters within their existing dTIMS analysis setup. The policy changes introduced a Customer Service Level (CSL) based corridor analysis to the traditional condition based analysis that Maine DOT used in dTIMS. As part of this project, Maine DOT wished to incorporate element level bridge data into dTIMS that would include five element groups: Culvert, Deck, Superstructure, Substructure, and Joints. The project demonstrated the flexibility and robustness of the dTIMS solution, that provides system sustainability to a long-term client. This project did not involve any software coding changes to adopt the new CSL management policies that were being requested by Maine DOT. 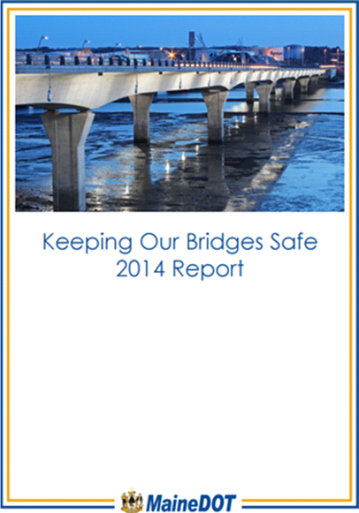 Maine DOT bridge condition shows network in good, fair and poor condition for 2014. Bridge needs were computed using the Deighton asset management software (dTIMS), as per the 2014 Maine DOT KOBS report. Click on the image to view the report.